All the Maya regions in southern Mexico, Belize, Guatemala, and Honduras shared a common creation myth about the Hero Twins and how they outsmarted the Death Lords of Xibalba and resurrected their father, securing life on earth for their people. This legend is recorded in the Popol Vuh, an 18th century copy of the original codex rendition that has been lost. Palenque’s unique myth incorporates deities widely known in their region, but nowhere else honored in the same way. The Triad deities were the patron gods of ancient Lakam Ha, bringing the blessings of abundance and prosperity when properly attended and worshiped. 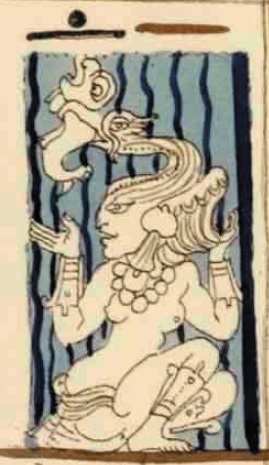 The ruling dynasty was believed to be descended from these gods and their mother, Lady Cormorant (Muwaan Mat in the Mayan language). Triad Progenitor, was born in 3121 BCE as related in the opening passage of the Tablet of the Cross at Palenque. She brought forth the creation, the “birthing” of the Triad Gods, and established the mythical charter for rulers to interact with the gods they were entrusted to care for and honor. These creation deities set the stage for the Fourth Sun, the fourth creation of Maya people after the failure of the first three attempts, as told in the Popol Vuh. The gods of the sky (Lords of the First Sky) and underworld (Lords of Death) were set in their proper order. This key calendar date is cited throughout all the ancient Maya lands, the creation of the current era on August 13, 3114 BCE. 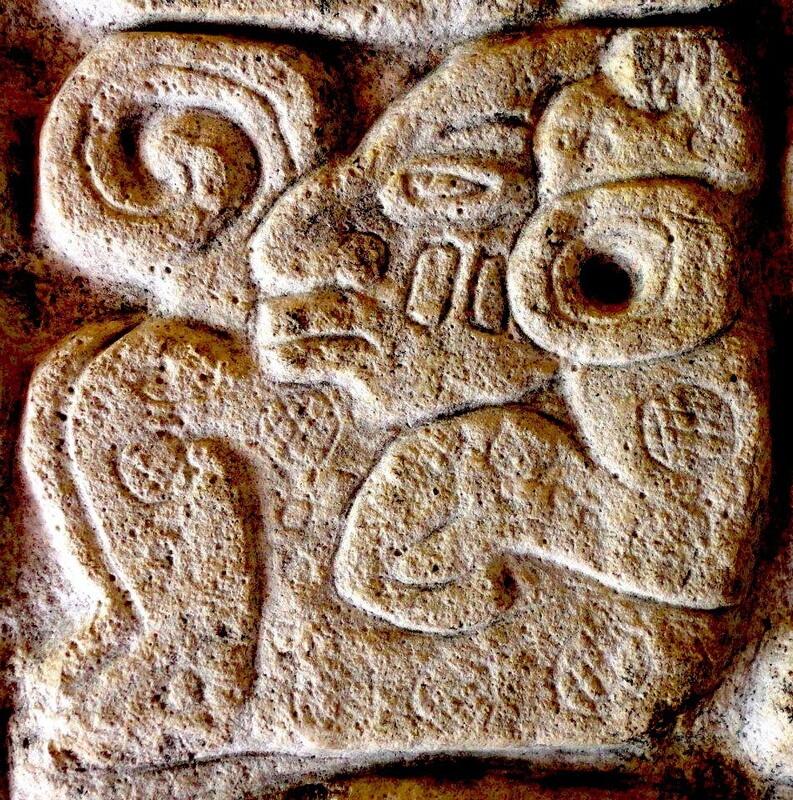 In the Maya Long Count Calendar, this date is written 13.0.0.0.0, 4 Ahau 8 Kumk’u. On this date, the “hearth was changed” and the three sacred stones were put in place in the heavens, serving as the model for all Maya household hearths. This implies the making of “new fire,” a ceremony that continues to be enacted in Mesoamerican cultures every 52 years at the Pleiades zenith. 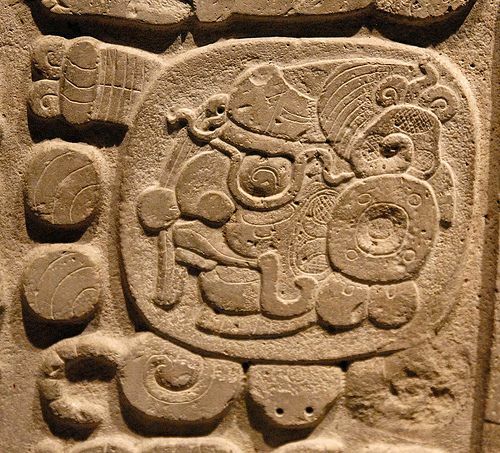 Over one year later, First Father descended from the sky and occupied the “Six Sky Ahau Place” dedicated to him in the north, indicating a station in the Maya zodiac. He was reincarnated as the first born of the Palenque Triad. The time was right for birth of the Triad Gods. Matawiil was a mythical place that lies at the heart of Palenque’s political and religious identity. Called “Place of Reeds,” it implies a swampy place associated with life emerging from fertile watery lands, a common Mesoamerican theme. Metaphorically, these births were described as journeys to some new worldly place, suggesting that a new order was being founded. 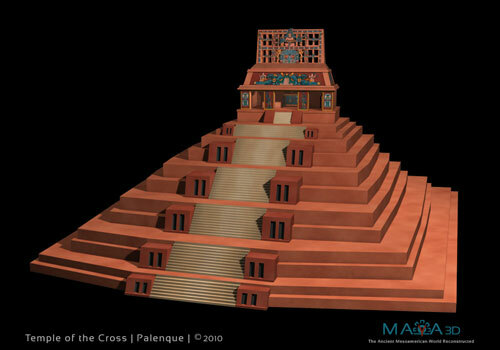 Now Muwaan Mat initiated the ruling lineage of Palenque. 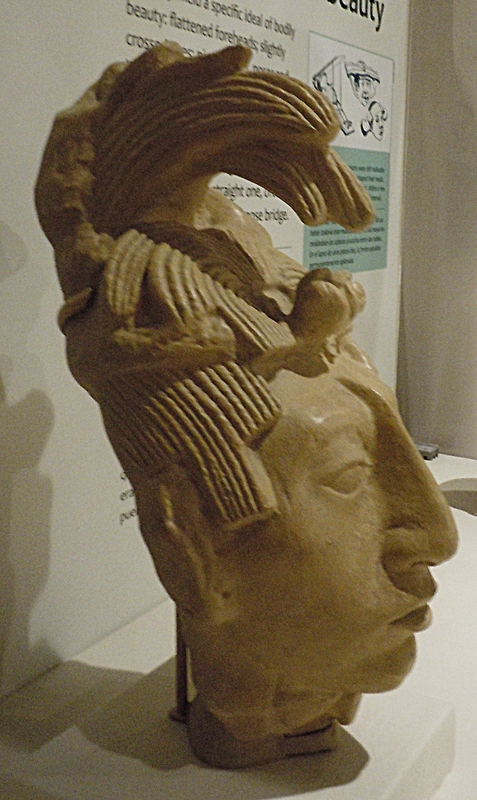 By the Maya Long Count Calendar, 800 tuns (360-day years) after her birth, she became the initial “ruler” leading to the Palenque lineage, assuming the throne in 2325 BCE by “tying on the White Headband.” The Triad Gods then took over creating the dynasty, making the Halach Uinik or “real people” of the Fourth Creation. They used yellow and white corn, water and blood to make the first real person, U K’ix Kan. This mythical quasi-human ruler was not born, but simply made and modeled by the Triad Gods acting as mother-father. U K’ix Kan tied on the White Headband 1300 tuns after Muwaan Mat became ruler. After another 1200 tuns, he brought forth the “time of duality” by drinking nine maize drinks given to him by Grandmother Xmucane, Heart of Earth and Goddess of Transformation. 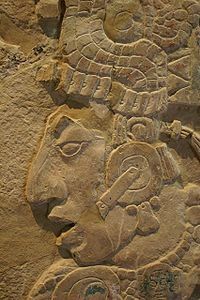 He divided into female and male in order to give birth to the first historic ruler of Palenque, K’uk Bahlam I.
sixteen generations of rulers, the most famous being K’inich Janaab Pakal I, or Pakal the Great who lived from 603-683 CE. Kan Bahlam II, son of Pakal I, set this creation story in carved hieroglyphs on the panels of the Cross Group, a complex of three pyramid-temples arranged to mirror the three hearthstones of creation. poetic rendition of Palenque’s Creation Myth through translations of these panels, and descriptions of how the Cross Group mirrors these Fourth Creation events. 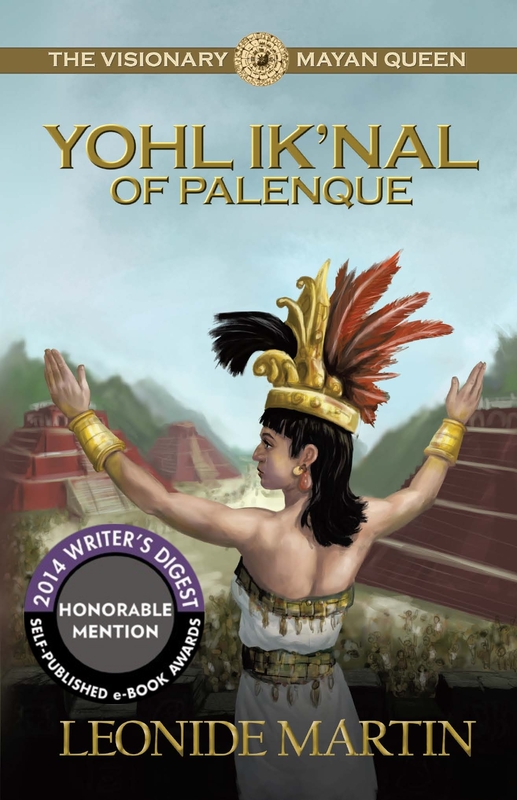 The Visionary Mayan Queen: Yohl Ik’nal of Palenque tells the story of Pakal’s grandmother and her recitation of the poetic Creation Myth. 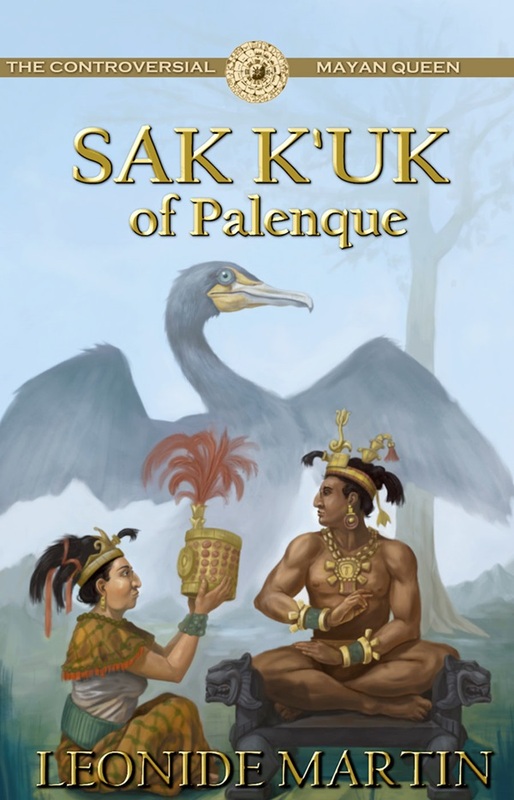 The Controversial Mayan Queen: Sak K’uk of Palenque tells the story of Pakal’s mother and the conflicts leading to his designation as heir to the throne. Gerardo Aldana. The Apotheosis of Janaab’ Pakal: Science, History, and Religion at Classic Maya Palenque. University Press of Colorado, Boulder, CO, 2007. Dennis Tedlock. Popol Vuh: The Mayan Book of the Dawn of Life, Revised Edition. Touchstone, Simon & Schuster, New York, 1996. Hunbatz Men. The 8 Calendars of the Maya: The Pleiadian Cycle and the Key to Destiny. Bear & Company, Rochester, VT, 2010.